AFTER nearly 40 years of former guerrilla leader Robert Mugabe's rule, 2018 opened with the successor he did not want, President Emmerson Mnangagwa, consolidating his rule and embarking on a global charm offensive telling whoever cared to listen that he would do things differently. On the whole, there seemed a national consensus that Mnangagwa's demeanour, body language and choice of words pointed to a new dawn for Zimbabwe. Mnangagwa's call to arms against corruption, a focus more on business rather than politics and the respect for human rights had the world sitting up to take notice. However, as the year progressed, the adage "talk is cheap" seemed to come true, but the Zanu-PF leader has had his moments. On the whole, it turned into a year of extreme emotions oscillating between hope and despair. Mnangagwa established a special unit to fight corruption. There have been reports of cartels with support from the judiciary pushing back against the anti-graft crusade. While there was a suggestion of gains in the first days with arrests, success has eluded Mnangagwa on this front. Time is not on the President's side, but if he cracks this one, it could determine his political future and his legacy. After the dramatic events of November 2017 that brought Mugabe's 38-year rule to an abrupt end, new Zanu-PF leader Mnangagwa had taken over amid euphoric scenes only comparable to the aftermath of the 1980 first all-race elections. Despite the fact that Mnangagwa had been very much a vital cog in Mugabe's political architecture, there was renewed hope among ordinary Zimbabweans of something better on the horizon. Mnangagwa made the right noises, his choice of words seemed to have been plucked from the opposition copy-book and his visit to an ailing MDC leader Morgan Tsvangirai on January 5 seemed a masterstroke. The hand of the military in Zanu-PF created an air of stability. On February 14, Zimbabwe was plunged into mourning after news broke that former Prime Minister and trailblazing opposition leader Morgan Tvangirai had succumbed to a two-year battle with colon cancer while receiving treatment in neighbouring South Africa. Tsvangirai emerged from leading the country's trade union federation, the Zimbabwe Congress of Trade Unions as secretary-general, helped form the National Constitutional Assembly as a vehicle for the demand of reforms in 1997. Then President Mugabe, at one Workers' Day commemoration, dared the firebrand Tsvangirai to join politics full-time, and the latter took the invitation lock-stock and barrel. The MDC was formed in 1999 and went on to lead a campaign for the rejection of a government-sponsored constitutional draft in early 2000. In June 2000, Tsvangirai led the MDC to a commendable performance in parliamentary elections before he lost the 2002 presidential poll in controversial circumstances to Mugabe. The MDC split over participation in senatorial elections in October 2005. Tsvangirai re-invigorated himself and won the first round in 2008, while his MDC-T took a slim majority in Parliament for the first time since majority rule. However, the then Zimbabwe Electoral Supervisory Commission took weeks to announce the results and claimed the opposition leader had not garnered enough votes to unseat Mugabe necessitating a run-off. Zanu-PF and Mugabe used brute force in the campaign for the June 27 run-off, forcing Tsvangirai to pull out at the 11th hour and the sham poll was rejected at home and abroad. Mugabe was forced to negotiate with his mortal enemy, creating a shaky Government of National Unity in which Tsvangirai served as Premier from 2009 to 2013. Elections were again called and Zanu-PF, according to the opposition, again rigged its way to victory. Tsvangirai cried foul, but Mugabe ignored him. At party level, the MDC-T again split in April 2014 after then secretary-general Tendai Biti and treasurer Elton Mangoma called for Tsvangirai to step down following the humiliating poll defeat. Tsvangirai again survived and went about rebuilding his party. A congress called in October the same year confirmed him as leader and Thokozani Khupe as deputy, then organising secretary Nelson Chamisa and party spokesperson Douglas Mwonzora went head to head for the secretary-general's position. Mwonzora won. In a surprise turn of events, Tsvangirai announced in May 2016 that he was suffering from colon cancer and weeks later, appointed Chamisa and Elias Mudzuri as vice-presidents to make them three. Tsvangirai's death triggered a messy power struggle that he may never have anticipated. 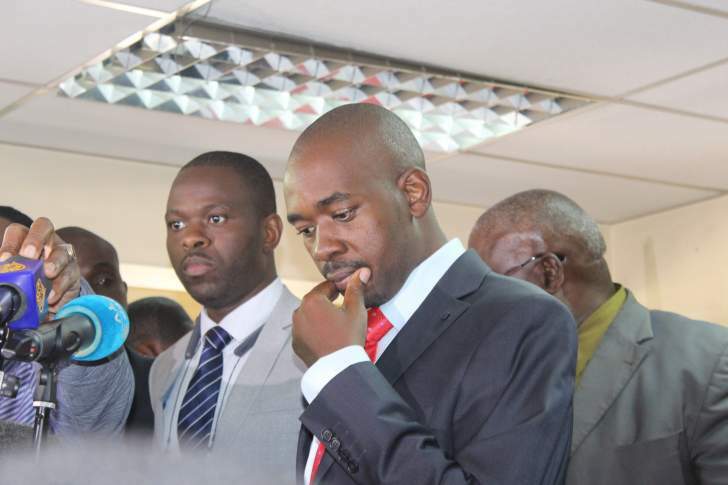 Within hours of Tsvangirai's death, Chamisa, who had been engaged in a fierce battle for control of the party with Mudzuri, reportedly summoned the party's national council and at which meeting he was confirmed initially interim leader for one year. Tsvangirai's spokesperson Luke Tamborinyoka also claimed the former Prime Minister had nominated Chamisa to take over. Tamborinyoka has since threatened to release audio recordings of Tsvangirai regarding his choice of successor. Khupe, Mwonzora and Mudzuri reportedly objected. Tsvangirai's family was split in between, leading to chaotic scenes at his funeral, including an attempt to torch a hut in which Mwonzora and Khupe had sought refuge in Buhera as party youths bayed for their blood. Chamisa went on to consolidate his position and the party's organs were railroaded into endorsing him as substantive leader "until the next congress" but internal ructions continue unabated. Over 20 candidates entered the presidential race, including singer Taurai Brian Mteki, Khupe, former Vice-President Joice Mujuru and, of course, Chamisa seen as Mnangagwa's main challenger and as it emerged, indeed, was. So confident was Chamisa that he consistently announced he would not accept any other result except a victory for his party. There was chaos in both the MDC Alliance, bringing together about seven opposition parties led by Chamisa. The coalition's rallies were well attended and the fact that he was allowed to campaign in areas previously declared opposition no-go areas raised hopes for his supporters. Mnangagwa also sought to project himself as different from Mugabe. He allowed foreign observers into the country and called for non-violence during the polls. His message seemed to have been accepted as reports of skirmishes turned into a trickle, unlike previous elections. While concerns were still raised regarding the impartiality of the Zimbabwe Electoral Commission (Zec), most were somehow hopeful Zimbabwe was turning a page. As results were being announced and the parliamentary returns showed a two-thirds crushing win for Zanu-PF, the presidential poll was closer than most could have predicted. Chamisa was performing well in rural areas, with Mnangagwa also making significant gains in urban settings. Constitutionally, Zec had five days within which to announce all results from July 30. But by August 2, tensions began to rise. Drama began late in the early hours of August 1 when then MDC Alliance national chairperson Morgen Komichi stormed the results announcement centre, Chamisa's spokesperson Nkululeko Sibanda in tow, to declare "Zec is announcing fake results". The following morning, hordes of youths demonstrated in Harare singing songs praising Chamisa. The protesters threatened to storm the national results command centre before police blocked them. As the situation deteriorated, with buses being torched and Zanu-PF offices as well as shops in central Harare being ransacked, the army was called in to help. Gun shots were heard and while the military has denied culpability, a commission of inquiry set up by Mnangagwa and led by former South African President Kgalema Motlanthe found the army had killed six unarmed protesters in the melee. The incident turned into the major talking point in an otherwise peaceful election whose outcome was according to some observers the closest to reality since the emergence of a strong opposition to Zanu-PF at the turn of the century. Mnangagwa was announced winner with 50,6% of the vote against Chamisa's 44,3%. However, his inauguration was stalled after Chamisa rejected the outcome of the presidential poll, arguing Zec had worked in cahoots with Zanu-PF to give Mnangagwa victory. The hearing, beamed live on television, held the country spellbound, what with Chamisa promising a smoking gun case that never emerged. On August 24, after almost a week of hearings in what turned into a national and international spectacle, the full bench of the Constitutional Court led by Chief Justice Luke Malaba threw out Chamisa's challenge for lack of merit. Mnangagwa was inaugurated as President for his first full term in the aftermath of the military coup that removed Mugabe. Chamisa continued to cry foul and to date maintains he won. Mnangagwa announced his Cabinet, with the major surprise being the appointment of banker Mthuli Ncube, who seemed to have been campaigning for the job as Finance minister. Ncube's first act as Treasury chief triggered a meltdown. In early October, Ncube announced government would begin to charge a 2% transaction tax across the board. The announcement triggered chaos in the financial services sector. The parallel market ran amok, with the United States dollar at some point trading at $600 against the local surrogate currency, the bond note or electronic transfers. Prices of basic commodities shot through the roof, goods disappeared from supermarket shelves and fuel queues re-emerged. While Zimbabweans had been struggling with liquidity challenges for over a year, the situation went into tailspin. Ncube is still groping for answers while the Reserve Bank of Zimbabwe has recoiled into a cocoon. 2019 is all but a toss-up; literally a gaze into thin air or open space. There is little for now to suggest things will be better at least to the common man. Socially, Zimbabwe is a tattered society lacking cohesion and as divided as ever. On the economic front, it's as bleak as ever, save for the rhetoric which has considerably shifted from Mugabe's belligerent talk. There is suggestion Mnangagwa knows what needs to be done. Whether he has the wherewithal or the political muscle to push everything through will be seen in the coming year. The Zanu-PF annual conference in December served as a reminder of the old rather than the birth of the new. Mnangagwa indicated he did not like praise-singing. He initially called for a more business-like approach to things and a lot less politicking. But the country is already in election mode. His endorsement as candidate for Zanu-PF in 2023, five years away left a sour taste in the mouth. The move was replicated in the main opposition MDC, with talk that Chamisa should not be challenged at congress next year. Bleak could be the ultimate word unless something dramatic happens which all Zimbabweans are hoping will come.